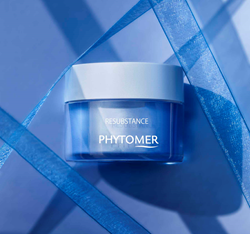 Formulated to treat dry, dehydrated, tight and uncomfortable skin caused by the sudden decrease of lipids following menopause, Phytomer introduces RESUBSTANCE Skin Resilience Rich Cream. It’s a dual action cream designed to plump and firm the skin by attacking the internal and external causes of aging thanks to two exclusive ingredients: Concentrated Brown Algae and Marine-Origin Corneogel. These marine ingredients actively work together to target each layer of the skin for a re-cushioning effect, designed to work from the inside out. Concentrated Brown Algae works beneath the surface of the skin and replenishes the deeper dermal tissues, re-plumping the skin from within. Marine-Origin Corneogel re-densifies the outter layer of skin to fill wrinkles on the surface. This ultra-nourishing moisturizer has a rich texture to saturate thin skin with a cocktail of lipids, leaving a subtle, fresh scent of orange, musk and marine notes. Day after day, RESUBSTANCE improves support and tone, leaving skin visibly firmer and more elastic. Directions for use: apply morning and evening to perfectly cleased face and neck. Marine-Origin Corneogel - restores substance to the stratum corneum to fill surface wrinkles with cellsfrom marine origin: seawater enriched with mineral NMF boosters, mico-algae concentrated in amino acid NMF boosters, lactic acid and lipids. In vitro tests on human dermal fiberblasts. **Satisfaction test on 24 women. Twice-daily application for 28 days.